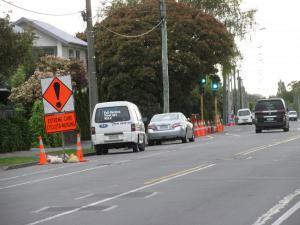 Sent to Christchurch City Council 24 sec later. Approaching the Milton St/Strickland St intersection, “Extreme Care Cyclists Merging” signs have been placed on both Milton St approaches and the Strickland St north approach. Yet none of the cycle lanes approaching, through or leaving the intersection are blocked, so cyclists do not need to merge anywhere. Around the intersection cones have been placed in the gutters next to the cycle lanes (so not impeding cyclists in the cycle lanes at all) – presumably they were moved there when work finished on the site for the day. Temporary speed limit signs have also been taken down on all of the approaches (but are still there on site). Why couldn’t the “Cyclists Merging” signs also have been taken down? Leaving out signs that are not relevant will just lead road users to ignore them in future, which may be in a situation where cyclists & motorists are forced to merge.